At the heart of Galilee Medical Center’s Pediatric Department, a new indoor playground opened for young patients to relax, play, and just be kids. Kids at play in the new indoor playgound. Since they are often unable to use the medical center’s outdoor playground for fear of possible infections, GMC has carefully designed and constructed an indoor play space to enhance the children’s healing process. Research shows that play is a critical component of brain development and growth. When a child’s daily routine is disrupted by a lengthy hospitalization, this process is threatened. In addition to the physical needs for which pediatric patients are being treated, there is often unintentional emotional and psychological distress. A new indoor playground helps normalize the young patients’ experience and provide a healthy outlet and opportunity to process the pressure and stress that the child may experience during hospitalization. 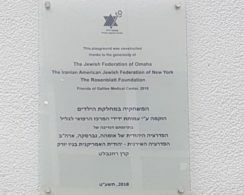 This playground is made possible thanks to the generous support of Jewish Federation of Omaha, the Iranian American Jewish Federation and the Rosenblatt Foundation through our Friends of Galilee Medical Center Association.